The Child’s Play series—now up to six films, with a seventh apparently underway—is now best-known for its campier entries, especially 2004’s Seed of Chucky. But the 1988 original doesn’t take that tone at all. Yes, it’s still about a killer doll. But it’s also surprisingly unsettling, for a variety of reasons. Chucky (created by Don Mancini, who’s written all the films and directed parts five and six; Fright Night’s Tom Holland directed this entry) also has a foul mouth, courtesy of Brad Dourif, who voices the doll in all the films. Chucky’s human alter ego, serial killer Charles Lee Ray, appears briefly, long enough to transfer his soul from his dying, gunshot body into a “Good Guy” doll that happens to be nearby. As bad luck would have it, the doll is purchased by Karen (Catherine Hicks), a single mom and recent widow scraping to get by while tending to the needs of her six-year-old, Andy (Alex Vincent). Andy might be the world’s biggest Good Guy fan—he eats the cereal, he watches the TV show, he lets it slide (at first) when his “Chuh-kee” doll goes off-script and starts slaughtering grown-ups. By the time Karen realizes Andy is telling the truth about his murderous plastic buddy, it’s nearly too late. Half of the scenes in the movie, and this is where it can get frustrating, consist of one character insisting THE DOLL IS ALIVE, and the other character being all, NOPE NOPE NOPE NOT POSSIBLE. 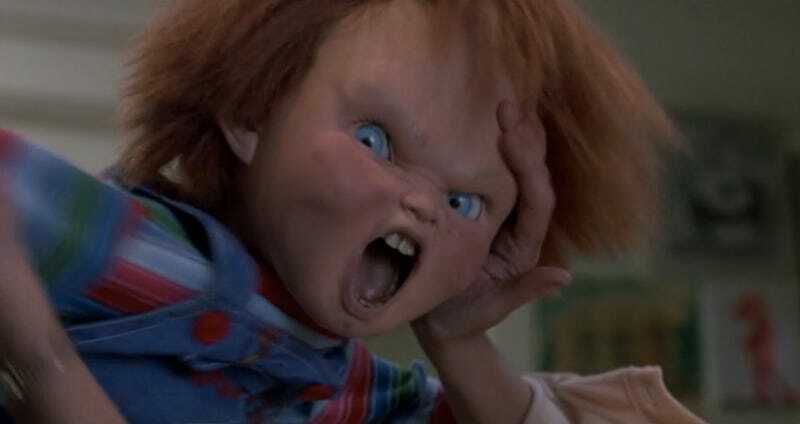 Fortunately, Child’s Play is only 87 minutes long, so the skeptics either die (bye-bye, psychiatrist who tried to lock Andy in a looney bin) or come around quickly; lucky for Karen and Andy, the cop who thought he’d closed the book on ol’ Charles Lee Ray, played by Chris Sarandon, soon sees for himself what black magic can do. About that whole voodoo thing. Before he kills the guru who taught him about transferring souls and such (see: incantation painted on Charles Lee Ray’s apartment wall, above), Chucky finds out that unless he wants to stay a living doll forever, he’ll need to possess the first human who found out his secret. (Technically, that would be Andy’s hapless babysitter, but she dies in act one.) This sets up the whole strings-shrieking-on-the-soundtrack climax, in which a doll brimming with evil must recite the world’s longest spell—seriously, long enough for Mom and Nemesis Cop to bust down the door—in order to commence with the body-swap. The doll may be defeated in the end (well, not really ... with all those sequels, Chucky really did win the day), but he’s still the smartest person in this movie. Like, we are explicitly told that Chucky can only die if his heart stops. Only. If. His. Heart. Stops. So why does everyone act like everything’s A-OK when he’s merely been lightly torched in the fireplace? Because then we wouldn’t have the amaaaazing finale, in which Chucky skewers every slasher-movie killer ever, and the Terminator, and maybe even Monty Python, and charges down the hall as Karen shoots off his limbs until he’s reduced to a crawling nubbin of white-hot hate. (It must be said, the special effects in this movie are outstanding throughout.) And EVEN THEN he keeps going, until someone remembers the thing about shooting him in the heart. Which works. Finally. Of course he came back in later films, again and again. But he was never so freakin’ spooky as he was here, was he? Hidey-ho!